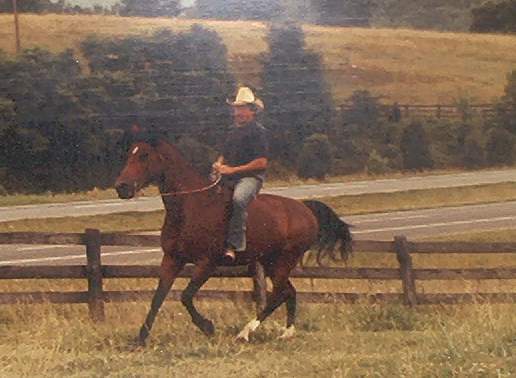 Once upon a time in our hero’s cowboy past he did a stint at a big farm in the mountains of western Virginia. It was a beautiful place to work. The total farm was about five thousand acres and was in three tracts. Two of these were close to each other and the third was about twenty miles away. One tract was basically the side of a mountain in the Alleghenies. There, cattle were run and a little hay was made on the lower parts of the mountain and as the steepness increased toward the summit there was forest. The main farm involved a couple of ridges that ran parallel to a river bottom and the headquarters was in the bottom along with a good bit of cropland. The ridges were in pasture where they were gentle enough to get a tractor and mower over now and again to prevent forest encroachment. The forest always reclaimed anything that could not be mowed and maintained. This farm had a storied past in the Angus business and had a good herd of well bred cows. The farm manager who had presided over the glory years had retired and the next few managers lacked the ability to produce a vision for the operation and direct the owners toward it, so the farm was floundering in obscurity without direction. The ownership hands on management had also passed to another generation who was an absentee owner who was maintaining for the older generation. While he was a good fellow and highly successful in another field of endeavor, he lacked the passion for the farm that success required. All of this is twenty – twenty hindsight that is crystal clear now. At that time our hero had a decent reputation in the Virginia Angus business and was looking for something bigger and better with a bit brighter future and he was lured to the operation as cattle manager and assistant farm manager, his mission was to rebuild the herd from the existing two hundred cows to four hundred cows and strive to achieve previous performance heights and reputation. Knowing the quality of the base cowherd, he jumped at the chance. You know the old saying about fools rush in. This proved to be the yearlong experience that caused our hero to vow that he would never touch another cow unless he owned it. While there were myriad issues that precluded achievement, it was a beautiful place to work and many pleasant days were passed on the farm. Many a morning was spent where the sun was greeted from atop a high ridge mounted on a good horse and watching the rising sun chase the darkness from the valley below to reveal the cows grazing in the luxuriant grass in the valley and on the hillsides. Baby Jim favored using a horse to check pastures because the horse could generally go where the cows could go and the four-wheel drive pickups could not come close to doing that. On the steeper reaches even a tractor was not nearly so safe as a good horse. All the locals had stories of overturned tractors on the hillsides and there was a local hierarchy of hillside-qualified drivers and equipment. This afternoon in March of 2010, which has been one of the wettest and snowiest winters locally on record and following the wettest fall in memory, our hero slipped in the mud on flat land and crashed into a corral panel, landing on a bad hip and an arthritic wrist. Rising from the mud, our hero declared enough of this stuff and trudged back to the house to watch a John Wayne movie. As he limped along he remembered another big slip. It was the spring of 1980….. A little later in the year than now. The grass was just starting to green up good. There was a good sized bunch of Spring calving cows that were being AI bred. That was in the days before widespread adoption of breeding synchrony. It was our hero’s habit to observe cows often and to gather and sort the breeders each morning. It was a rainy spell and had been showering off and on for a few days. That morning it was raining steadily as Baby Jim guided his leggy Bay mare up to the ridgetop in search of the herd. Naturally that morning in the rain they were scattered on the side of the second ridge over and were as far from the corrals as possible. Some were lying in the woods higher up and some were scattered across the hillside grazing. Baby Jim pointed the mare at the far wood line and she picked up a meandering trail that zig zagged up the hillside to the forest. Arriving in the forest and getting above the cows, they halted to allow the mare to blow from the climb and to let Baby Jim have a few minutes to observe the cows. After a few minutes they began to stir the cows and haze them toward the corrals. Now it should be noted here that on most days, the top item on the “To Do List” of any given cow is usually not “Go to the Corral” . In fact most often the opposite is true. Baby Jim would usually try to counter that bovine tendency with some hay or silage or other cow goody in the corral but when grass is growing some cows just don’t seem to want to play by the game plan. It pretty quick became clear that today was going to be one of those days. The whole bunch resisted moving and gathering. But this was not our hero’s first gather and the big bay mare was learning her craft well and soon they had the cows bunched and moving down the far ridge and thru the valley and up the second ridge. The only thing to worry about was that the cows didn’t top the ridge and break off to the right as the corrals were in the left corner. But that left hand side was the least steep route off of the ridge. There was a daily balancing act of motivating the stragglers and still getting to the ridge top before the leaders saw an opportunity to divert. The stragglers were particularly troublesome that day but our horse and rider topped the ridge in time to convince the leaders to continue in the desired direction. But then the stragglers stalled again. Both horse and rider could see one particular cow that was thinking. They had to scramble back down the ridge to motivate the stragglers and then hurry back to the ridge to maintain the direction of the group. When they got to the stragglers they gave them a hard push to get them to catch the main body of the herd. The cows knew where they were supposed to go but some days they just didn’t wanna. As they regained the ridge with the stragglers moving at a good pace it was relieving to see the leaders heading in the right direction toward the corrals. To get to this vantage point Baby Jim had passed a few of the stragglers and suddenly one cow broke back and to the right. She attempted to go behind the horse and rider and back to the woods. But having already gained the ridge top the horse was easily able to cut the cow off and redirect her toward the herd. Now this ridge was not big enough to be called a mountain. But it was sure bigger than a hill. On the front side there was probably four hundred feet of elevation and on the back side maybe three hundred feet with slopes up to about thirty or forty percent. Dotted across the faces of the ridge were some little coves, which were basically pockmarks that were too steep or too rough to mow and they generally grew up in scrub trees. This cotton picking cow took aim at one of those coves and took off at a gallop. Baby Jim considered letting her go but was uncertain if she was one of the cows needed, and besides that, if she learned that she could get away with such behavior it would happen every day. So they headed into the cove after her but not at a gallop because it was steep. About the time the mare got to the steepest point the cow burst out the far side of the scrub trees and hightailed it for the herd. Job well done as the leaders were near the corrals now. About that time the bay mare lost traction. One foot slipped and then another and then all four. Baby Jim let her have her head and she tried valiantly to climb but she could not get a foot to stick to anything. There was a thin veneer of soil in that spot and underneath that soil was a solid sheet of bedrock. With the wet conditions the soaked veneer of soil was simply peeling off of the rock. Unable to go up hill the mare turned to go across the hill but the footing was no better and she nearly fell twice and Baby Jim guided her to face down hill. The mare was alternately sliding and bracing and scrambling and steadily going down hill. Baby Jim feared that if he tried to step off that he would throw her down the hill. He also did not think he could stand and did not want to end up under her scrambling feet. RIDE AND PRAY. It was only seconds but it seemed like an eternity. Things were starting to look grim and suddenly a foot stopped sliding. Then another and the mare nimbly got stopped. Baby Jim eased out of the saddle and managed to keep himself upright. He looked up and saw that they had slid nearly a third of the way down the slope from the little cove, probably 70 or 80 feet . The mare was stopped and trembling all over but she was still slipping. No foot would hold traction on the steep wet rock for long. They stood for a moment and tried to find a way out of this jam. Baby Jim studied the landscape and tried to calm the mare. She trusted him and followed his guidance. There was a spot about twenty feet to the right that, if they could get to it, the slope eased and they could possibly get out of this mess. But it was still raining and that twenty feet was still steep and uphill in two directions and there was still a good chance of having a very bad day. Baby Jim tried to get the mare to stand while he tried it but when he ventured forward she turned and tried to follow and she slipped. Baby Jim was ahead of her and he pulled on the reins as hard as he could and he slipped as well but gave her enough purchase to get a foot on something and she scrambled out after him and together they scrambled and clawed their way up to the somewhat flatter spot and stood there for five minutes counting their blessings. They walked back to the ridge top and Baby Jim remounted and followed the last of the stragglers down the hill to the corral and set about the days work. They had left a gouge in the hillside that was clearly visible from the road and it was only with great determination that Baby Jim stayed his hand later in the day when someone critically complained about what fool had caused the big gall on the side of the hill.